Valley fever is caused by a fungus which grows in the soil of our native desert environment. 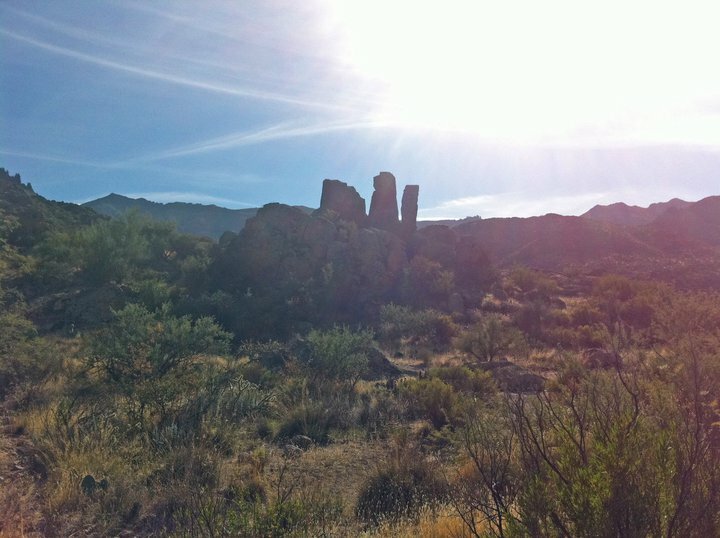 The fungus causes a disease commonly called valley fever because it occurs throughout the Sonoran desert valley. How does my pet get this disease? Some signs seen in dogs are respiratory disease, limping, inner eye infections (uveitis), skin lesions (wounds, lumps) and seizures. Some dogs will not show any specific sign of infection, but the owners notice that they are lethargic and often have a decreased appetite. Does it occur in cats? Cats less commonly develop disease from the organism but they can become infected. They can show the same signs as dogs, but will often have open draining lesions from bone infections. How do you diagnose the disease? Diagnosis is via an antibody (blood) test specific for the organism. Scanning radiographs may be helpful depending on the body system involved. Radiographs (x-rays) will often show inflammation and enlarged lymph nodes on chest films but definitive diagnosis still requires a blood test. Once infection is confirmed treatment can begin. Treatment for this infection should always be considered a long term process of at least a year. Typically, we’ll start medication after the diagnosis and recheck the blood titer every 3 months until negative. A titer is a measure of the patient’s immune response to the infectious organism. It is not an actual measure of the organism. However, a declining titer often correlates with an improvement in clinical signs (outward signs of illness) and resolution of the infection. Antibiotics are not useful in treating this fungal infection. Specific antifungal medication is needed. The more common medications are Ketoconazole, Fluconazole and Itraconazole. All the medications commonly occur in a pill form and are given once or twice daily by mouth. In the past the medications were cost prohibitive, but now they are widely available at many pet pharmacies at a reasonable price. All “azoles” can elevate the patient’s liver enzymes with continued use so liver values should be a routine part of screening. Ketoconazole tends to be the least expensive of the group and is widely used. 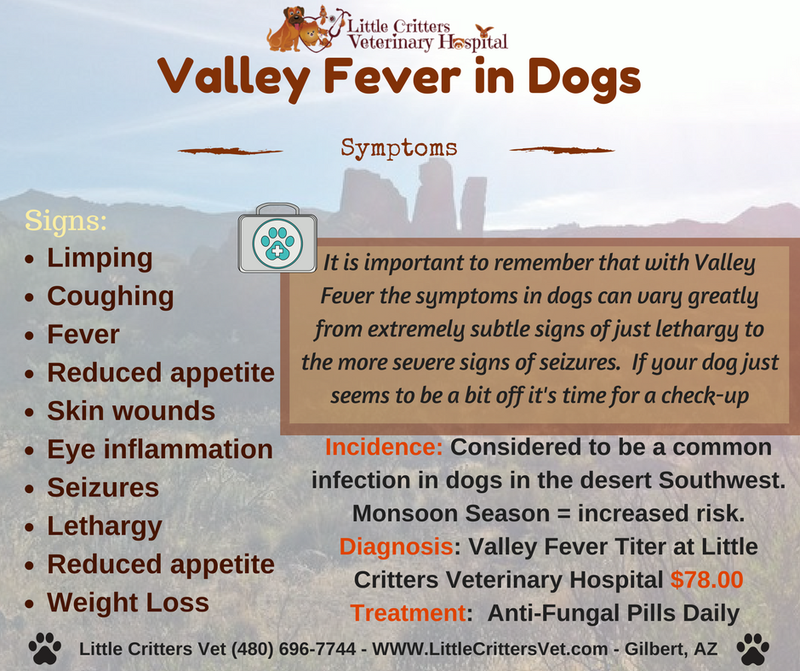 Fluconazole is able to cross into the central nervous system and is the only drug used to treat “central” valley fever infection (typically the seizuring pet). I’ll often start pets on Fluconazole because in my experience it seems to have fewer side effects. But, all pets are different and many will respond well to Ketoconazole. Regardless of the drug used it is important to monitor the appetite and advise your veterinarian if a loss of appetite or vomiting is noted. As I’ve said, treatment for this disease is long term and you should not expect to quickly see an improvement. Often it is weeks before improvement is noted. You should not, however, see a progression of the disease. How can I prevent infection in my pet? Unfortunately, there is not a vaccine to prevent this disease. 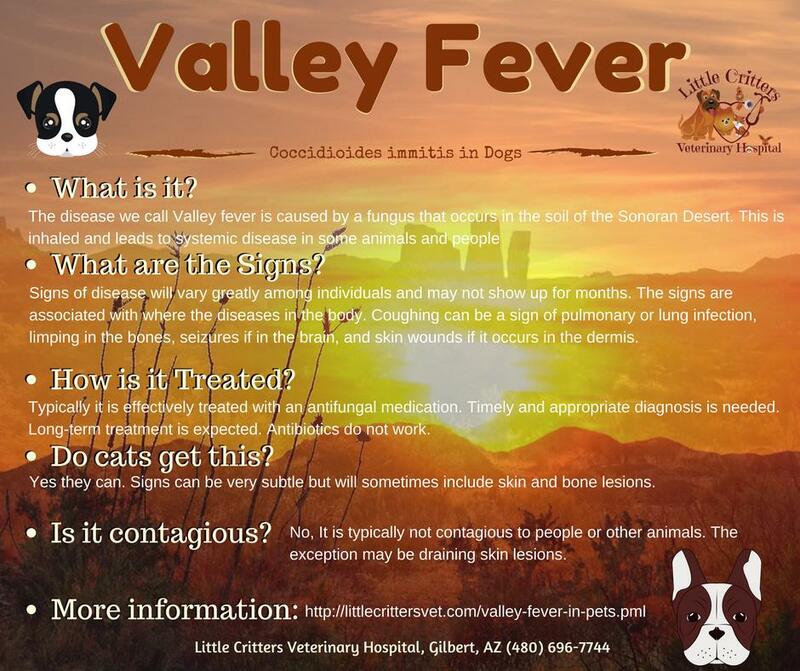 The best we can do in the valley is to reduce the risk factors for our pets and respond quickly to signs of disease. It is also important to realize that many pets will live all their lives in the valley and never become ill from this organism. – Hiking/ hunting – Dogs that spend a lot of time in the native desert environment .